Got burgers on the grill? Try these. Can we ever get enough burgers in the summer time. There’s just nothing like a good grilled burger with just about anything you want to put on it. Last Sunday night we were invited to friends’ house and had some delicious grilled burgers and it got me thinking that we don’t do burgers nearly often enough at our own house. Seems like when our kids were still home we had hamburgers once a week. Then it got to where I hardly ever fixed them for just the two of us. If you were from the town we grew up in, Caruthersville, MO and you ordered a burger it would almost certainly have mustard, pickle, onion and slaw. Yes, slaw. Not really coleslaw but a grated cabbage with a little Miracle Whip, sugar, and mustard. My mother always made thin crispy burgers and those were really good but now I really like a thick juicy burger with a lot of stuff piled on top with a toasted bun and the toasted bun really makes a difference. I love making our doubled stuffed burgers which are two very thin patties with a slice of tomato, onion, jalapenos and cheese in the middle, grilled, put on a toasted bun and ready to ooze cheese all over you when you bite into it. The double stuffed burgers are also great with caramelized onion, Swiss cheese and mushrooms. We decided to do some burgers a few nights ago with no bun (gotta cut those calories someplace because I have several ice cream recipes I want to try this summer) and I was looking for something else to throw on the grill. The tomatoes and onions were perfect. The tomatoes were the on the vine type and I just cut them in half. The onions were our Texas 1015 which is Texas’ version of the Vidalia onion from Georgia. With our herb garden just steps away from the grill, it’s always easy to just reach over and grab some herbs to put on the grill. 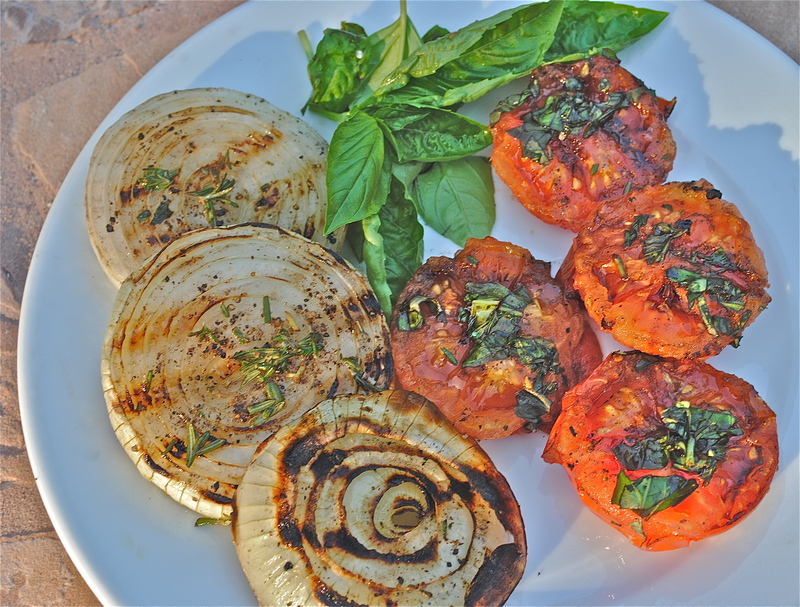 I used oil, basil and some balsamic on the tomatoes and oil and rosemary on the onions. 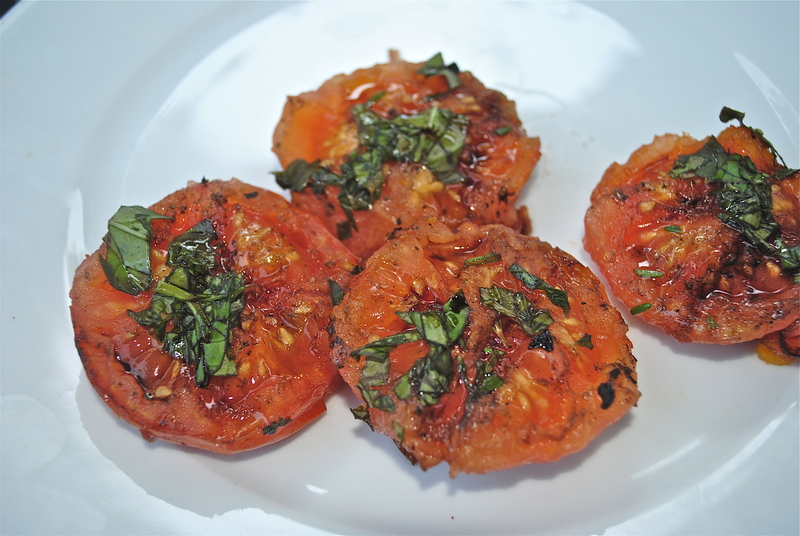 They were delicious and healthy side dish to the burgers. My goal for the summer is to try some healthier burgers made with chicken, turkey and maybe a shrimp and salmon burger. Oil the onions and tomatoes and watch them brown. Try and turn only once so they don’t fall apart. Cut side down first. Drizzled with a little balsamic vinegar and garnished with fresh chopped basil. Peel the onions and slice into 3/4″ slices. Keep the rings together. Cut the tomatoes in half. Brush olive oil on both sides of the onions and tomatoes and sprinkle with salt and pepper to taste. 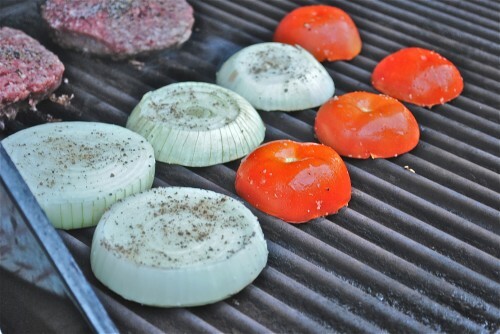 When you have a hot fire going in your grill put the onions and tomatoes on grill. I put the cut side down first on the tomatoes. 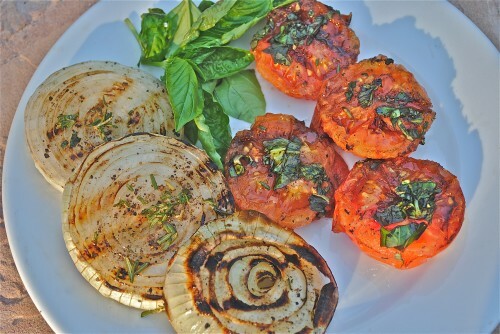 Grill these until you have nice grill marks on both the onions and tomatoes. Using a spatula, carefully turn over the onions and tomatoes being careful that the onions don’t fall apart. Using two spatulas definitely help with the onions. After you flip these, brush or drizzle more olive oil over the onions and tomatoes. Sprinkle the fresh rosemary over the onions and the basil over the tomatoes. 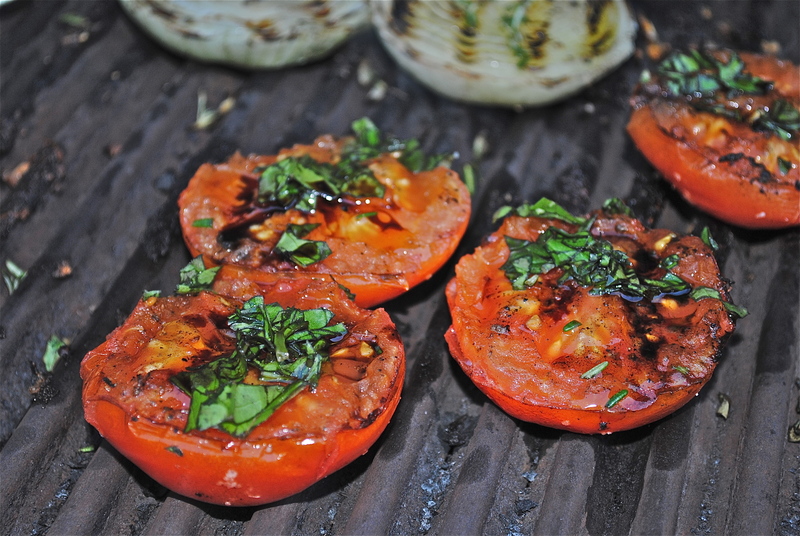 When ready to remove from the grill, drizzle some balsamic vinegar over the tomato halves. Serve and enjoy. *Notes: Use as many tomatoes as you have people. I had the smaller vine ripen tomatoes and I did two halves each. Also, the tomatoes may get done before the onions are nice and brown so if that happens, just move them over to the side of the grill or remove from heat. Both of these are good served at room temperature also. Sherry, The recipes get better and better! Thanks!